The ureter truly commands a rather unique position in anatomic studies, owing chiefly to its ever-changing internal lining and its highly specialized muscular coatings [4,16]. The ground-breaking work of Protopopow , Satani , and Stein and Weinberg  clearly showed that the ureter displays morphologic plasticity, physiologic accommodation, and anatomic change under different conditions, e.g., physiologic function, stress, obstruction, and aging. 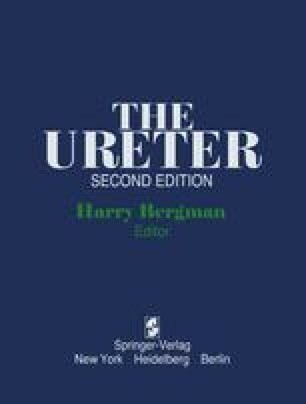 Until the recent developments of fine structure and microcirculatory studies combined with immunochemical analyses it appeared that knowledge pertaining to the ureter was “totally known.” Recent work demonstrates most clearly that all was not totally known. Witness the very articulate studies of Hicks [18–20], Monis and Zambrano , Hoyes et al. [21,22], Notley [28–33], Aung-Khin , Dixon and Gosling [7,8], Gosling and Dixon [12–15], Kanczak et al. , and Firth and Hicks [10,11].